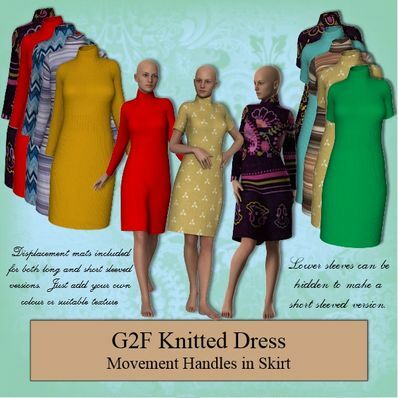 A Knitted Dress for Genesis 2 Female for use in Daz Studio 4.6. Lower Sleeves can be hidden to make a short sleeved version. 2 Displacement Mats included for long and short versions, just add your own diffuse colour or suitable texture. Love the high neck, the long/short sleeve options, thank you. Thank you for another great outfit. I tried it with Lilith6 - best results! The textures are perfect. I love the black floral designs. Thank you very much! I used it with a quick render on DAZ's Olympia 6 and seems to work wonderfully! The folks at the site worked through the earlier issues with the McAfee anti-virus warning (Norton declared the file clean) and everything seems good again. You have the most wonderful clothes!!! Nice. Thanks! - @behansen: Scanned with Panda and with Malwarebytes and the file is fine. Try another free antivirus. Almost all are better than free McAfee! I attempted to download this twice but felt obliged to cancel the download both times. Free McAfee software gave this a "yellow" rating for "potentially annoying" download. I've never had this problem with any of Wilmap's things before, and I've downloaded stuff many times from her without any virus alerts, both from here and formerly on sharecg.com. It would be great to see this resolved. Very nice....A selection of belts might add to it well.